Superconductor Classical and Opera: Opera Review: Where's the Kaboom? The Met revives Dez McAnuff's “atomic age” Faust. in Act V of the Met's revival of Gounod's Faust. Photo by Cory Weaver © 2013 The Metropolitan Opera. The Metropolitan Opera’s current version of Charles Gounod’s 1859 grand opera Faust has, (like the atomic bombs that inspired its director Dez McAnuff) emerged once more from the opera house’s top-secret laboratories for another round of testing. On Thursday night, the performance failed to reach critical mass. 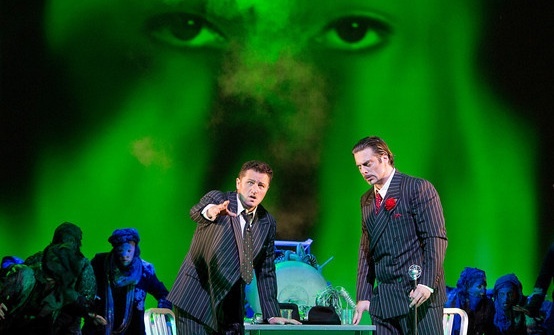 Mr. McAnuff’s Faust is produced in collaboration with another opera house--in this case the English National Opera. In updating the story of the soul-selling German university prof to the atomic age, the director raises some uncomfortable questions. To start with, he seems to miss the fact that Goethe's play (and the opera's libretto) takes place in...Germany. If the production is set (as indicated by the costumes) between the two world wars, is this a portrayal of a failed Nazi nuclear effort? From the first bars of the Prelude to Act I, conductor Alain Altinoglu took a slow approach to the music that emphasized lyricism but sacrificed any hint of demonic power. Things picked up in the second act with the first big chorus and the Song of the Golden Calf. The third act saw the control rods firmly back in place, preventing any sort of energy release from happening on the stage. Act IV and V were somewhat better, but problems with the singers emerged. Much hay has been made (mostly by the company's marketing department) of the trio of leads in this revival. Piotr Beczala’s first Met Faust can be counted as the greatest success, despite a noticeable crack in his voice when he reached above the stave in the last stanza of “Faites-lui mes aveux.” The tenor improved, anchoring the duel with Valentin and the big trio in the prison scene. However, he played Goethe’s devil-dealing scientist as a bland Everyman staggering blindly through Mr. McAnuff’s nuclear nightmare. Under ordinary circumstances, John Relyea sings with a fine, sturdy instrument. On Thursday night, he veered between curiously muted and an outright bellow in his big, forceful solos. This charmless performance got a few laughs, mostly from cheap prestidigitations. By the time he addressed the audience in Mephistopheles’ little Act IV serenade, the devil had lost. As the endangered Marguerite, Marina Poplavskaya gave a troubled performance. In Act III, she delivered a bland, pretty pair of gems in the Song of the King of Thule and the Jewel Song. Later, she was hampered by a voice that thinned noticeably in the cathedral scene. In the last act, it vanished altogether. The Russian soprano exited quickly, climbing the five-story industrial stairway to heaven as the chorus sang of her character’s salvation. At the curtain call, she turned to her colleagues. Shame-faced, she tapped her throat. The supporting cast was mixed. Alexey Markov was a colorless Valentin, making Marguerite's brother the most boring figure in the opera, even though he sang his notes well enough. One simply didn't care when he was murdered by Faust in Act IV. His cursing of Marguerite was overlong and unsympathetic. Catherine Cook’s Marthe made one hanker for Wendy White. Julie Bouilianne was the best woman in the cast, making the most out of the tiny role of Siebel. The Met chorus overcame Mr. McAnuff’s fetish for fitted lab coats and vintage military uniforms to deliver a performance of their customary high quality.